Offer your home style and class with the Flaybern Counter table with Four Stools. The pieces of this set are all constructed of lovely blended woods in a casual light brown finish that is sleek and versatile enough for any style of kitchen or dining area. The table has a double stacked top and can extend to seat up to eight people, while the stools have open slat lumbar support backs for your convenience. The seat cushions are covered in a textural grayish brown color that is chic and comfortable. Ideal for all occasions, both big or small, this dining set will beautifully accomodate for years to come. 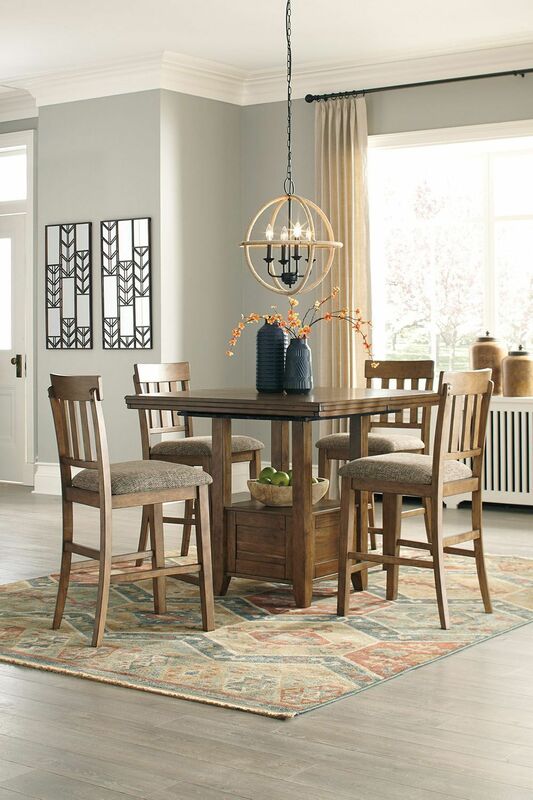 The Flaybern Counter Table with 4 Stools is just the set you need to complete your home dining space. Counter height- extends from 42" to 60"
Set includes table and four stools.